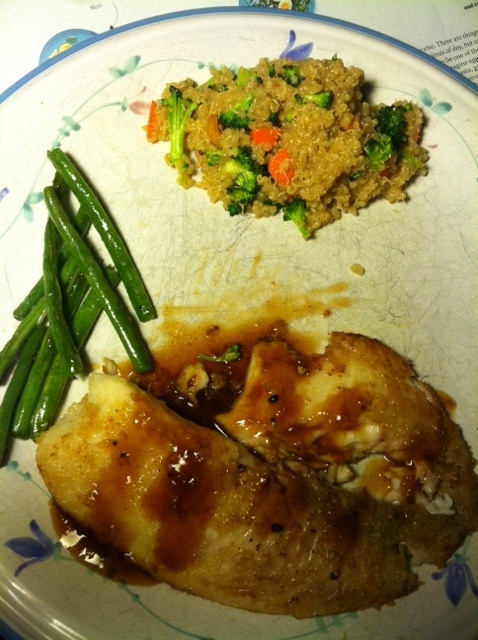 Panko crusted Tilapia with Asian Infused Quinoa and String Beans! Tilapia with Panko crust, broccoli and carrot quinoa & string beans! Cook quinoa on stove top- boil 2 cups of water for every 1 cup of quinoa, fluff after boil and let simmer, add raw carrots, broccoli and peanuts and combine. Add 2/3 of the teriyaki sauce to the quinoa and stir. Serve hot or cold/warm. Steam String beans stove top or in microwave, combine with garlic and toss with Extra Virgin Olive Oil until coated. You can add sea salt and pepper if you want, I do not!